[Bingo] did some work porting Versaloon for STM8 and STM32 discovery boards. Versaloon is a multiple-architecture programmer that we saw a few weeks back. At its center is an STM32 microprocessor, which greatly simplifies the work necessary to use the two discovery boards instead. Flashing the firmware to the boards will zap the ST-link firmware and [Bingo] doesn’t know of a way to restore that so be warned. This hack is still pretty fresh off the bench, but so far it looks like vsprog and OpenOCD both work just fine with the new hardware. I would like to know how to do that. I have a v1 STLink that I want to upgrade to v2. I bought a couple of these boards awhile back; programming them didn’t seem like the issue, it was more the absentee tool chain… is there a way to compile code for these POS’ yet? Hey Jeppe, I will like to restore one of my discoveris. Do you still have the firmware? I have corrected a problem with the Reset on the STM32VL. Containing links to the current firmware for the STM32VL , STM8S and for building OpenOCD. 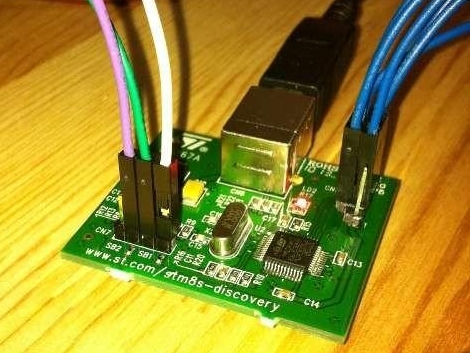 The bootloader url: Includes bootloader (maple clone) binary + patch against the maple bootloader & Versaloon firmware adapted to work with the bootloader, for the STM32VL. I didn’t have the time to adapt the STM8-S Versaloon firmware for the bootloader yet. Anyone know if the firmware for the STM32VL will work in the ST-LINK? I opened the ST-LINK and it look similar to the schematic for the STM32VL.